Saveitforparts.com is finally putting itself on the map, with the purchase of a genuine, bona fide, electrified, six-car monorail! That’s right, I’ve bought an entire six-car monorail train from the Minnesota Zoo. The zoo’s elevated monorail system was retired in 2013 after 34 years of service, with the state-owned agency seeking to dispose of the equipment. As a lifelong train enthusiast with ongoing railroad history and model railroading projects, I couldn’t resist the chance to preserve a piece of local history! While it would be awesome to construct a track and actually run the monorail, my resources are more suited to a static use of the cars. My initial plan is to park them on a rural property and use them as weekend cabins, as each car is similar to a small camper or RV in size. Interestingly, some of the Twin Cities’ TCRT trolley cars were used the same way after their retirement (sadly, most were scrapped or burned). Below is one potential layout I came up with for a single middle car, leaving as much of the original body intact as possible (the seats are molded into the fiberglass inner shell). As the cars already have lights, heating vents, and multiple doors, it should be relatively simple to retrofit them for such a use without much alteration. I have some ideas for using multiple cars as well, the final layout will be exciting to develop! I’ve also been doing quite a bit of research into the history of these monorail trains. While it’s certainly a very niche field of study, I’ve collected a few details that might be of interest to other monorail enthusiasts. 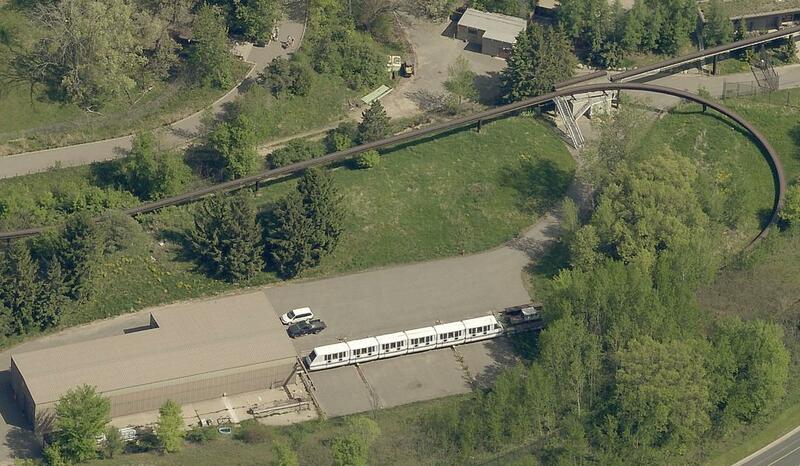 Monorail switch and maintenance building, courtesy of Dakota County GIS. The Minnesota Zoo’s Monorail was built in the late 1970s by Universal Mobility Inc (UMI), and is a “Unimobil Tourister” model. 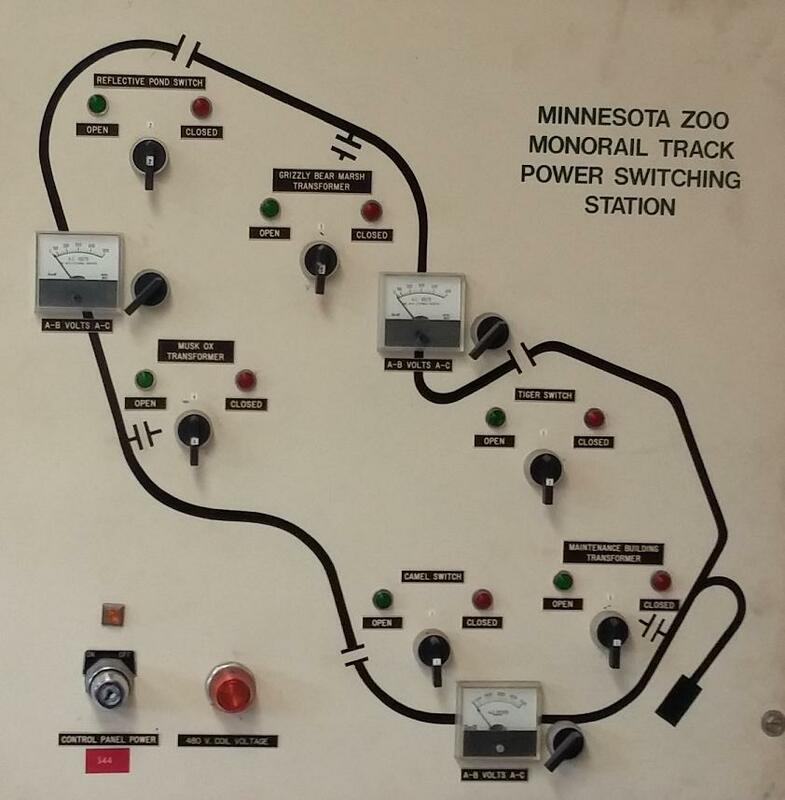 It began running in September of 1979 at the new Minnesota Zoological Garden (opened May 1978). The Minnesota legislature authorized the monorail with the provision that it be self-financing, separate from the zoo. 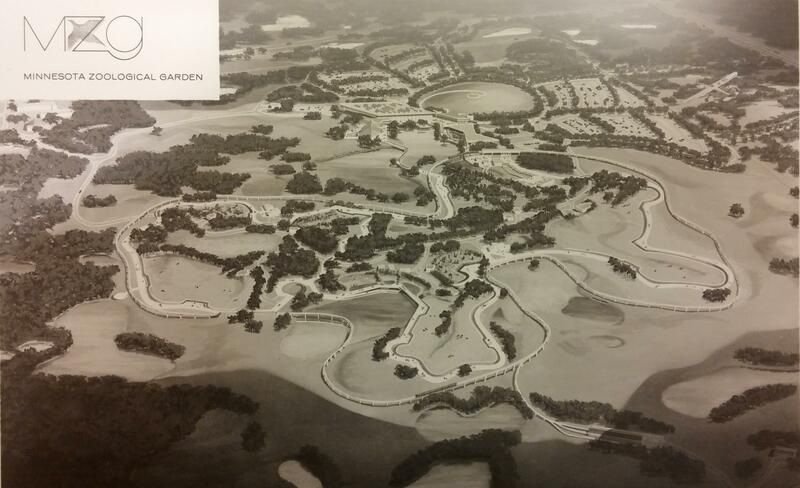 A nonprofit corporation, Minnesota Zoo Ride Inc, was incorporated in 1976 to finance the accepted construction bid from UMI. The system included 3 trains, an oblong loop of track, an enclosed maintenance shop, single switch, and indoor & outdoor sidings for storage and maintenance. 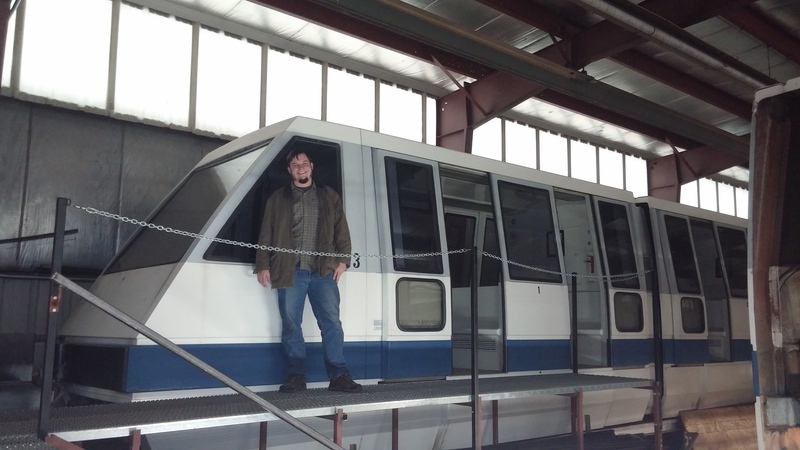 Based in Salt Lake City, Universal Mobility designed and installed several similar monorail systems in the United States. One other Tourister of nearly identical design was installed at the 1984 World’s Fair, then moved to the Miami zoo where it still operates. Updated Tourister II models operated at King’s Dominion, King’s Island, and Carowinds amusement parks, while older, open-car versions operated at various amusement parks and are still used at Hersheypark in Pennsylvania. Another Unimobil system reportedly operated at Fuji Highlands in Japan. Several proposals were floated to install UMI monorails in metropolitan areas for public transit, but none were funded. 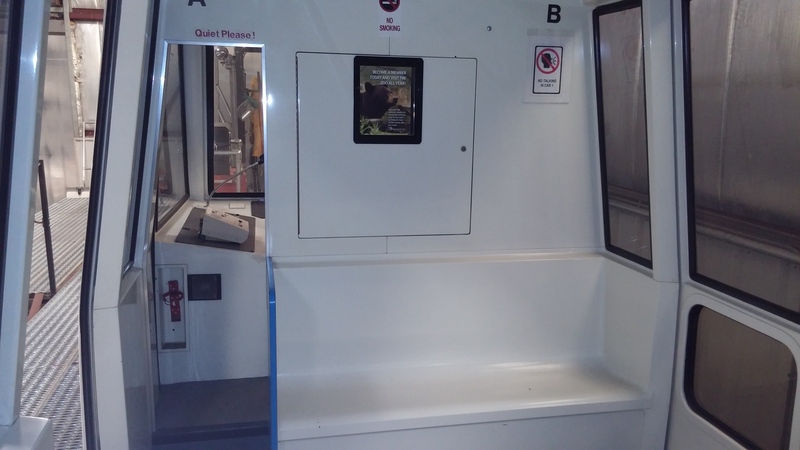 The fiberglass car bodies were produced by Intermountain Design, who still manufactures monorail, people mover, and aerial tramway cars for various users. The mechanical drives and control systems were supplied by Maschinenfabrik Habegger of Switzerland. This company was tied to Von Roll Holding Co (designer of the Sydney Monorail among others). Both companies also designed ski lifts and aerial cable tramways (The Skyride at the Minnesota State Fair is a Von Roll system). Bombardier / TGI later acquired many of the UMI and Von Roll patents and produced another very similar monorail, known as the UM series. Von Roll / Habegger also marketed a very small monorail for use on farms and vineyards. 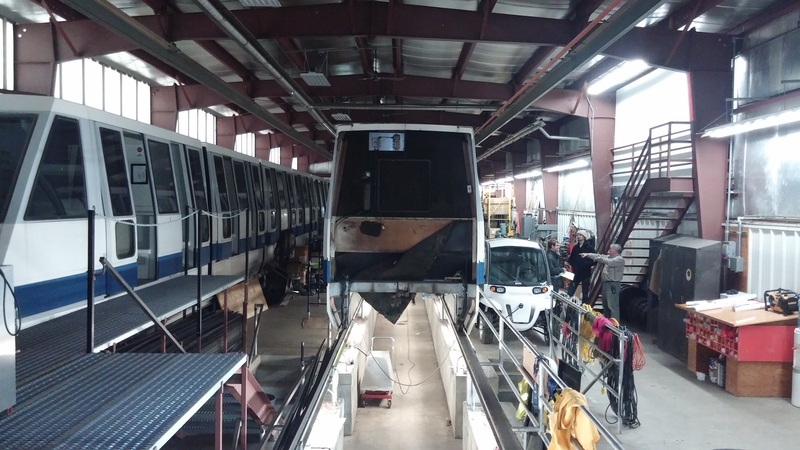 The Minnesota Zoo monorail ran into trouble almost immediately after installation, as ridership was not as high as predicted. The legislature refused to pay the full installments to investors, covering only what the ride actually made in fares. Shareholders (including various local and national banks) sued to demand the full loan amount in 1980. The state supreme court sided with the legislature and attorney general, saying that the state had no obligation to pay if the legislature chose not to. The state was again sued, this time accused of securities fraud. Court cases dragged on through the early 1980s, involving investors, insurance companies, and various state agencies. The monorail remained operating, with profits covering only a fraction of the installments. Fares in 1980 were $1 for adults and 50 cents for seniors and children. 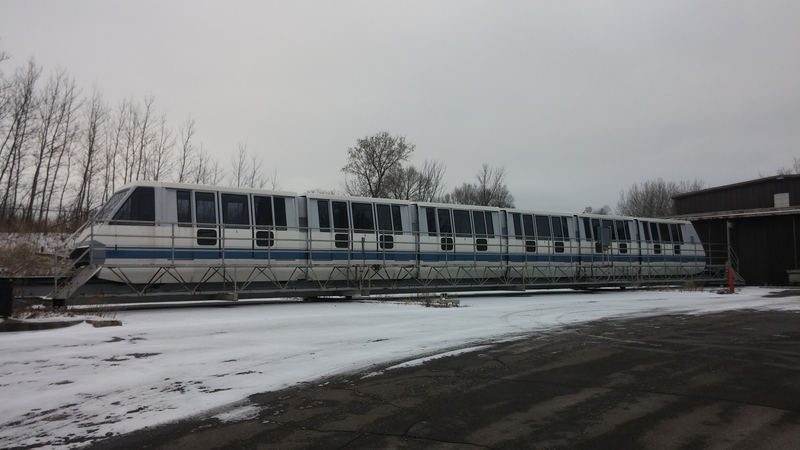 In September of 1985 the monorail system was repossessed, then sold back to the Minnesota Zoological Foundation with help from private donors and new loans. The monorail continued to report little or no profit, despite fares climbing to around $5 per person in recent years. These ongoing money problems may show why monorails never gained much of a foothold in the US, despite the optimistic press of the 1970s. The energy crisis briefly brought a renewed flirtation with public transit (as well as other energy-efficient projects and proposals in Minnesota and elsewhere). 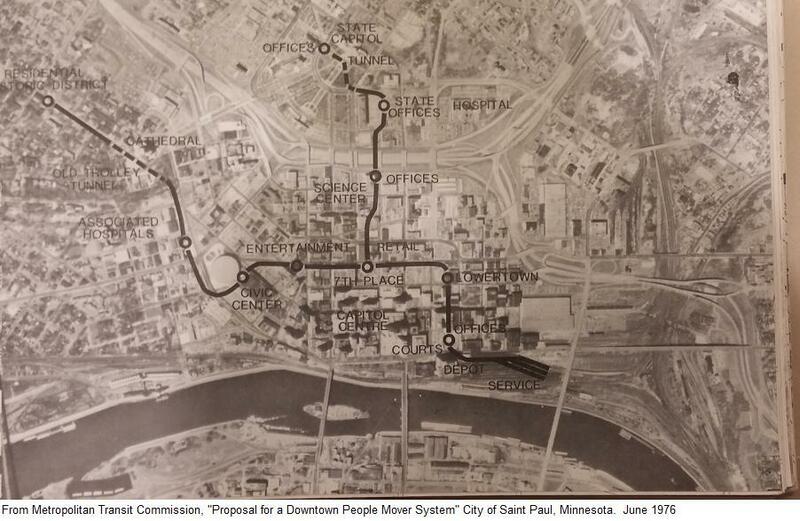 Proposals for installing UMI monorails (or related people-movers) included downtown Saint Paul, Los Angeles, and other cities. 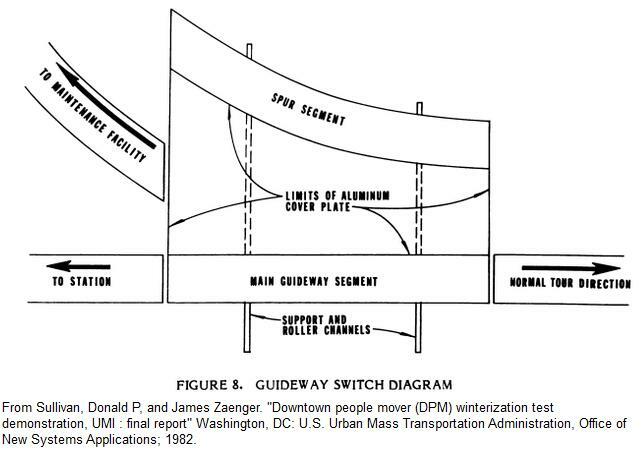 Concept drawings for some of these installations can be found in several 1970s government studies. 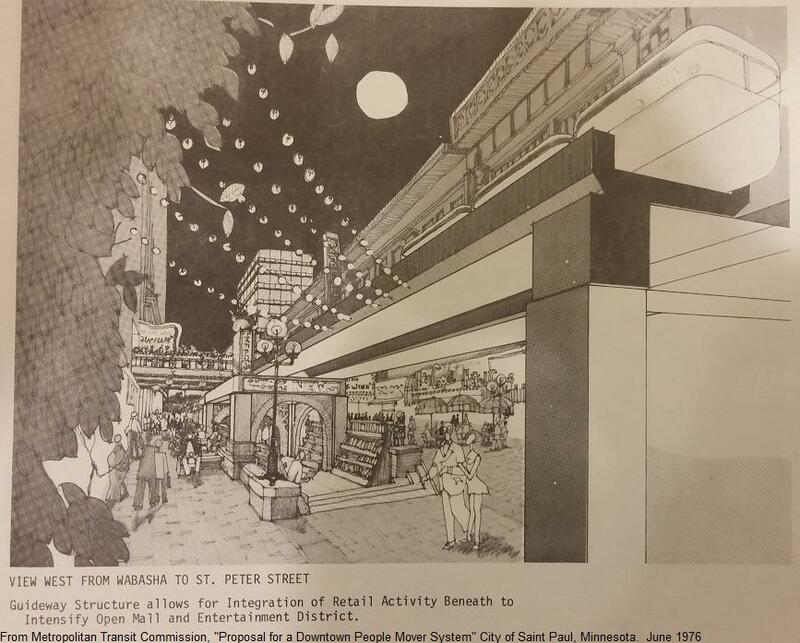 A proposal for downtown Saint Paul imagined a monorail or people mover running through the former Selby streetcar tunnel, as well as a section of subway with station at the State Capitol. Other cities considering monorails looked closely at the Minnesota Zoo as a test case. The zoo’s system was one of the first all-weather monorails installed in the US, and underwent extensive winter testing to prove it could function in northern cities. 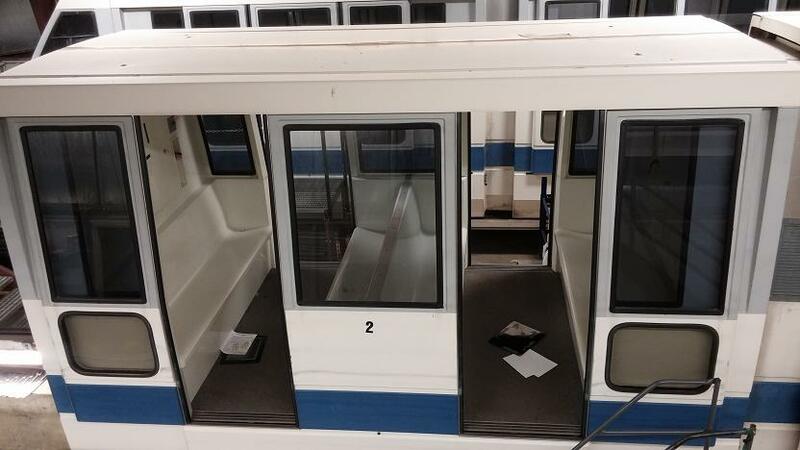 This monorail was one of the few with onboard cabin heaters, others had only A/C. A custom snowplow was fabricated for the train, mounted to one of the lead cars. 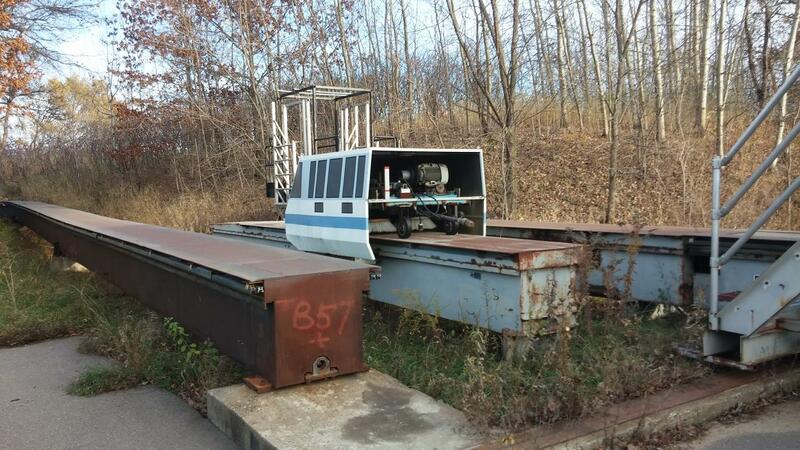 Later a small street-sweeper device was built, and made to look like a miniature version of the monorail. Winter operation studies found that the elevated track did well at preventing snow buildup, but sometimes iced over and impeded traction. The power rails were located under a lip at the track edge, which helped keep them dry, but there were occasional issues with ice and thermal expansion. Hard specifications for this monorail are difficult to nail down, each document I’ve found lists a slightly different weight, speed, and capacity for this system. As best I can determine, each of the three trains could carry 96 passengers seated, or 120 with some standees. Trains were 100ft long and consisting of 6 cars. Wheel bogies were shared between cars, with a total of 7 per train (normally 4 powered and 3 idler bogies). The motors developed about 300hp at peak output, for a theoretical top speed of about 35mph. Normal cruising speed was around 3-4 mph and operations at the MN zoo were limited to a 7.5mph top speed. The main track included a 6,628ft loop and a 358f long maintenance spur. A moving switch connected the spur and loop, and a lateral transfer beam allowed switching between tracks at the maintenance building. Approximately 1,000ft of guideway made up the lateral beam and service rails at the maintenance shop (some of the outside sidings were removed). 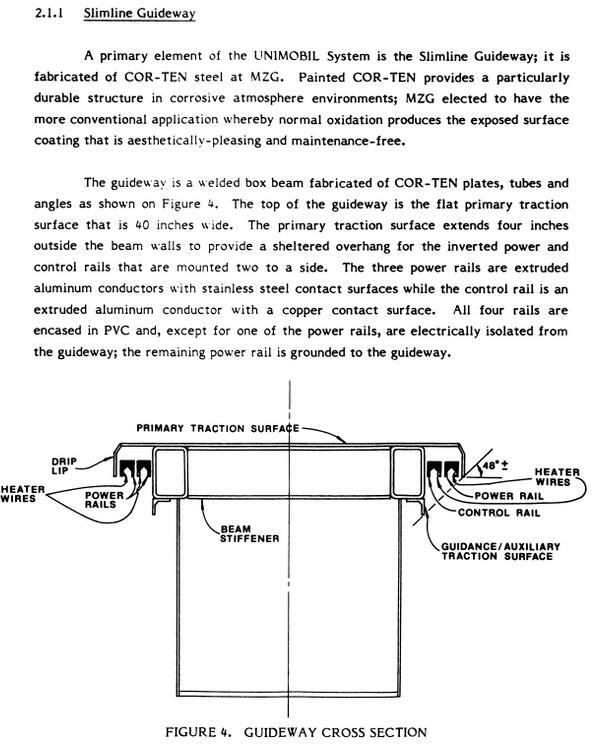 About 730ft of guideway was at-grade, the rest elevated on steel columns. 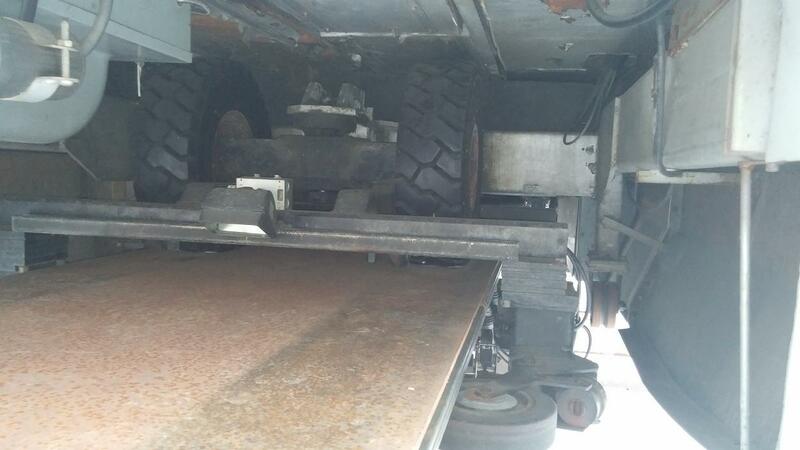 The drive system consists of rubber tires driven by 480v DC motors, with side-facing guide wheels riding the outsides of the track. Power and control signals were picked up from electrified rails under the lips of the track. Braking was dynamic, with emergency and holding brakes. The system was supposedly very quiet (“…as softly as a cloud”), although the AC compressors for summer use could be noisy. The system was designed to be fully automated, controlled by an analog computer. Cars could be timed and spaced automatically, with multiple trains slowed or stopped as needed to avoid collisions. Human drivers could override the system, and also manned a microphone to narrate the ride and identify animals along the route. I am looking forward to preserving one of these very interesting trains, and creating a unique and historic vacation cabin! And who knows, maybe someday, or somehow, I can get some track laid down! UMI Downtown People Mover Winterization Test (1982 report including details specific to the MN monorail). This entry was posted on Monday, June 1st, 2015 at 5:30 pm and is filed under monorail, Projects. You can follow any responses to this entry through the RSS 2.0 feed. You can leave a response, or trackback from your own site. Gabe, how are you going to move it? Seems like a big project. Hi, it’s Helen, the Sydney Monorail Nut who photo-documented the demolition of the Sydney Monorail System, picked up a few souvenirs here and there, tried unsuccessfully to get the rights to disassemble and reassemble a monorail station with really cool architecture as my own home, …. and ultimately bought 5 Von Roll Type III carriages worth of monorail, motors, bogeys and misc control parts, to restore and get running at some point on land in rural Australia as the fulfillment of childhood dreams to (1) have a garden railroad, (2) be a monorail driver, (3) work on a monorail in my retirement. Yes, this is for real, I HAVE A PERSONAL MONORAIL, TOO! Mine’s currently in storage but if you’re ever in Sydney, you’re welcome to come for a visit. So far I have investigated the systems used for power and control. 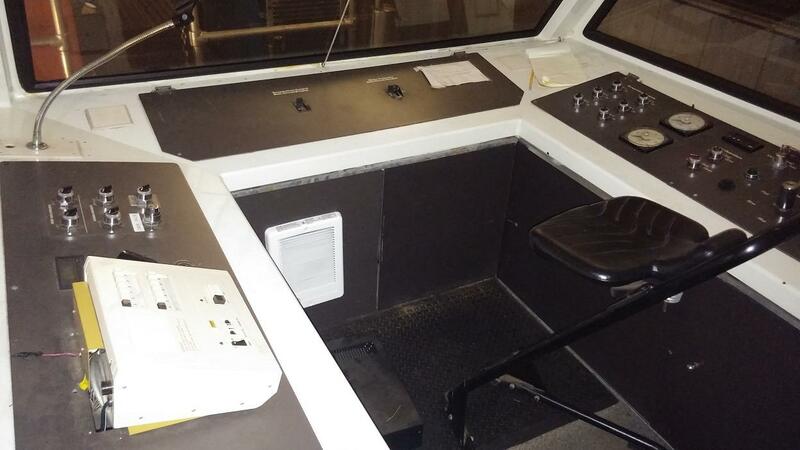 Because mine sat in a salvage yard for over a year, I’ve pretty much got to do a complete tear-down and test, and probably need to understand and refresh the programming of the train and motor control systems (based on Siemens and GEM80 technology). Fortunately, it turns out that small-scale monorail trains like this are *NOT* that complicated. I don’t know about yours, but mine’s probably less complicated than the average electric car. I was gobsmacked at how few moving parts were involved. Regarding this: “Hard specifications for this monorail are difficult to nail down, each document I’ve found lists a slightly different weight, speed, and capacity for this system.” <- I hear ya. I have the same issue for mine. By the way, my resources are more suited to a static display of yesterday’s future, too, but where there’s a will, there’s a way. I’m going to learn how to do it, so I can do a lot of the work (except for the certifying and electrical work that must be done by licensed contractors) myself. Because, you know, I believe I’m different than tens of thousands of boat restorers and train restorers who came before me. 🙂 (Oh, the naivete of someone on their first restoration!) My monorail is probably more complicated than many boats, but less complicated than just about any loco ever built, and the shell is fine, it’s just the works that I have to work on. Yeah, I know I’m up against odds. 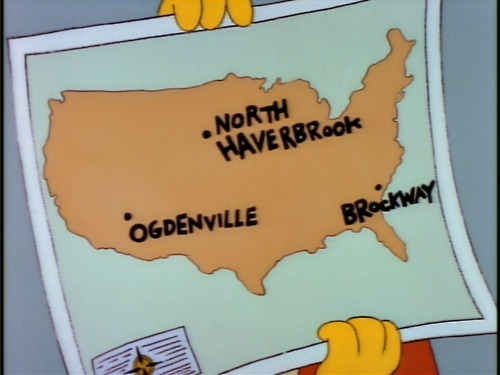 I also know how amazing it would feel to beat them, and to claim a “backyard monorail”, and therefore consider it worth having the go of my life, at it. I already have a bit of knowledge of the Siemens PLC’s. I have access to the autopilot system manual at a local museum, although I don’t have the manual myself. I’m looking for the GEM80 docs. I have a few spares in terms of components like bogies. Different documents cite different minimum bend radius for rails… don’t have an idea as to what a minimal track with a curve in it would have to look like yet. Studying structural engineering at the moment to learn a bit more about modeling stress/strain in static and dynamic systems before I get serious about determining what incline if any my beam can have, whether it can curve, etc. Patents for aspects of the bogie design (which by the way look a lot like yours as well) are available. The hydraulics (read: brakes and possibly other systems within the train), I know nothing about at this point. The biggest resource challenge by far is powering it, and I’ll admit I’m no closer to figuring out how to do that today, than when I bought it, other than using the non-standard European transit very high voltage it currently runs on, which takes a massive amount of inbound power from the grid and runs it through transformers. The ideal goal is stored-battery supply and eco-friendly power generation via solar (I am in Australia, after all), but who knows if I’ll reach that ideal. An electrician felt that I could run a 4 carriage train, albeit slowly, with a single one of the motors I have. That may be step 1, but still the challenge of where to get an insane number of kVA to do that, remains, and I’m not convinced yet that converting it to run on a different voltage isn’t a better answer. After structural engineering comes electrical. 🙂 One step at a time.